As summer is nearing an end, you may be cleaning up your yard for the final time before the fall descends upon us. That includes putting away patio furniture, stowing away the barbeque, and likely some fence cleaning. When it comes to wooden fences, they can be a little temperamental—so it’s important to take precautions when cleaning your wooden fence to make sure you don’t cause any damage, or harm yourself in the process. While it’s best to hire a professional to clean your wooden fence for you, it’s good to know a few tips and tricks you can do on your own. Before you start cleaning your fence, make sure that the area is cleared of any items that could get in the way. Be sure to cover any plants near the fence, and use plastic sheets to protect the grass nearby. Whether you’re using a power washer, cleaning agents, or both, you’ll want to make sure that your greenery is protected since they could be harmed or killed during the cleaning process. Before you clean the entire area, test your cleaning solution or detergent on a small area. 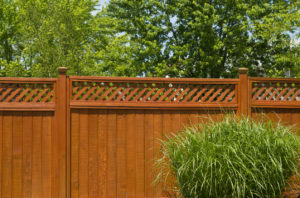 Check to see if it damages your fence at all, or strips the paint/stain away. If it does, you’ve likely bought a product that’s too harsh, and need something a little gentler to just get rid of the dirt. Once you’ve protected your plants and found a cleaning solution that works for your fence, you may begin cleaning. However, remember to only use cold water, since hot water can make staining and sealing difficult, since it can raise the grain of the wood. Once you apply cleaning and/or brightener, you’ll need to wash it off within 15-20 minutes, or less if its instructions indicate. If you leave the solution on for too long, it can affect the absorption of the sealer, and leave residue behind. Use a wide spray nozzle. Keep a consistent distance of more than 12 inches between the nozzle and the fence to avoid stripping away paint. While washing your wooden fence may seem like something you can do on your own, many people cause serious damage to their fences when they try to do it themselves. To ensure your fence receives a proper and gentle clean, call Total Fence Inc. Whether your job is big or small, we have the expertise to handle it all. Contact us today for more information, or for a free quote.